In my research there were conflicting claims as to the origin of these cocktail buns. They are known as Hong Hong Cocktail buns but many sources said they were Chinese in Origin. I consulted one of my Chinese friends and she stated that from where she comes (Southern China), there are no baked goods which they make. And she couldn't even tell me what the name means. She explained that she knows only Mandarin and that probably means something in Cantonese which is mainly spoken in Hong Kong. She could only tell me that Bao means Bun. So whatever be the meaning, wherever the origins of these buns lie, these are some of the best cocktail buns we have enjoyed. I made it mildly sweet so we could enjoy the natural sweetness of the coconut. G for Gai Mei Bao. The previous posts in this Mega Marathon are.. Warm the milk with 1 teaspoon of sugar and add yeast to it. Set aside in a warm place for the yeast to froth up. In a stand mixer add the flour, custard powder, yogurt, salt and the remaining sugar. Pour in the milk with the yeast. Mix all the ingredients listed under 'For the filling' . Knead well to make a stiff dough. Refrigerate until needed. Mix all the ingredients listed except the sesame seeds under 'For the topping'. Make sure it is in a batter consistency. Pour it in a piping bag and set aside until needed. Divide the filling into tablespoon portions. (I got only 7 portions). Flatten each of the dough portions made and place the filling and close the edges making sure the filling doesn't ooze out. Arrange all the buns in a lined baking tray, cover and set aside for a second rise (about 30-45 minutes). Preheat the oven to 360 °F. 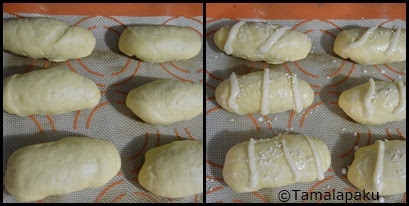 Brush the prepared bun with milk and pipe 2-3 lines with the topping mixture which we set aside in a piping bag. Sprinkle sesame seeds and bake for about 18-20 minutes or until tops are golden brown. Remove from the oven, brush with butter and enjoy them warm. I baked this cocktail buns for a baking event and simply fell in love with it, especially the stuffing, tempting me again. Nice filling in the buns! Beautifully baked. Coconut filled sweet bun....am drooling right now! Looks awesome...bookmarked! Nice bake.. Awesome work.. Love all you breads!! I guess there are so many dishes that we still need to explore, this one looks classic!.. The buns look fantastic , beautifully baked . Love the stuffing too. There are many recipes where we get lost when we look for country specification. Every cuisine has long forgotten recipe and thanks to bloggers like us we bring them back to life. I made the Gai mei Bao just couple of months back and loved it. Your buns have come out amazing and I am now tempted to bake them again! I need to second Valli. :-) I learnt a lot about the history and origin of these recipes via this BM... Whatever the origin, love these buns. Great pic. I have had the same problem with my Chinese cookies recipe. My Chinese friend could not even recognize the name of the dish -- just like you, I just went with it any way. Those buns look amazing. I'm bookmarking them to try soon. The buns looks so yummy. Same thing happens with me all the time when it comes to some specific recipes.